Reviewed by Dan Hastings on January 10th, 2018, playing on Nintendo Switch. Super Mario Odyssey is Mario's first big adventure on the Switch and the first major release of a Super Mario game since the Wii. 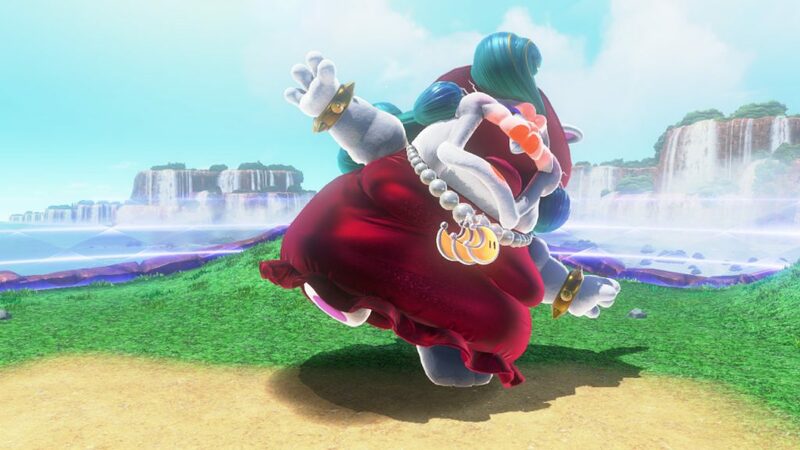 Bowser has very unexpectedly kidnapped Princess Peach and is forcing her to marry her (which I found a bit creepy) and it is now up to Mario to save her. With a new, magical hat at your disposal, you must take control of creatures from across the kingdoms in order to reach Bowser and save Peach. It's your cut and paste Mario story, but somehow I found it to be one of the best Super Mario games in the series. When it comes to Nintendo, I am very firmly in the Zelda camp. I would never purchase a Nintendo console in order to play a Super Mario game, but I do enjoy them. I expected to enjoy Odyssey, but I did not expect to enjoy it half as much as I did. I enjoyed Super Mario Galaxy 1 & 2, but I would never say I loved them (I never finished either of them). Once I started playing Odyssey, I couldn't put it down. I haven't enjoyed a Mario game this much since I first played Super Mario 64. Super Mario Odyssey is likely the best Mario game that I have ever played! I don't want to waste time talking about the story of a Super Mario game as it is the same story as every other game, but the hat in this game needs to be discussed. 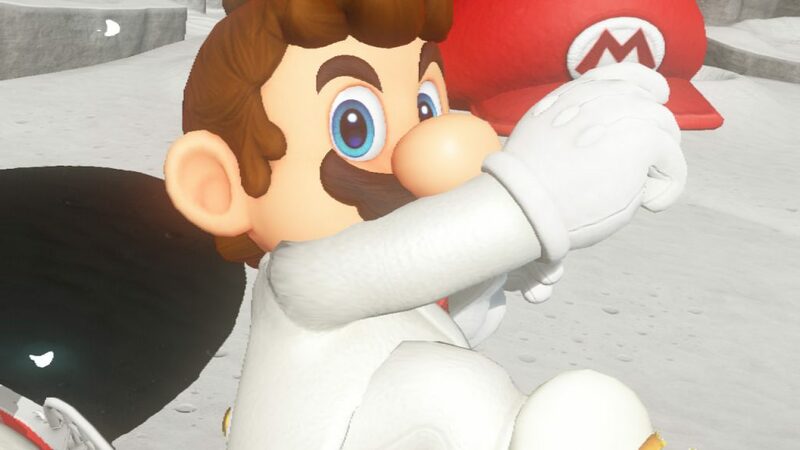 If you have seen any promotional material for this game, you might have noticed that there are eyes on top of Marios hat. This is because it is no longer a regular hat, it is now a living creature..that just happens to be a hat! But Why?! I hear you ask? I think the bigger question is why does a 12ft dinosaur want to marry a 5ft princess against her will? That's a question for a different discussion. To answer the original question, It's a Mario! Things like living hats don't need to make sense. In the opening video for the game, your hat gets destroyed while fighting Bowser and you happen to fall from a flying ship and land in a kingdom made of living hats! Thus marking the beginning of a fantastic relationship between a man and his hat. All joking aside, the hat actually turns out to be a fantastic tool in this game. You can use it to attack enemies, a platform to jump on and most notably, take control of other creatures. What's that!? A sleeping T-Rex? Let's not question why its here and instead, proceed to throw your new hat at it! Yes, in Super Mario Odyssey you can actually take control of a T-Rex and it's awesome! There are a huge amount of enemies in this game that you can take control of, each of them providing some sort of unique game mechanic that is required for you to solve some nearby puzzles. The game would have been great without this feature, so the addition of it makes a game that is already good at its core, even better. This is by far the best looking Mario game to date and I think we have hit a point where the game cant look any better. Mario will never work with photorealistic visuals and as of right now the art style works and looks absolutely perfect on the Switch. The resolution is high with very few jaggies when playing in docked mode. All of the textures are smooth and clean. Since the art style of Mario is quite clean and smooth, I don't think it can get any better than this. Visually, Super Mario Odyssey is everything you could ask for. The trailers for the game show pictures of Mario in a "realistic" looking city. This is in the game, but it is just one of the many kingdoms and it is quite a small one at that. 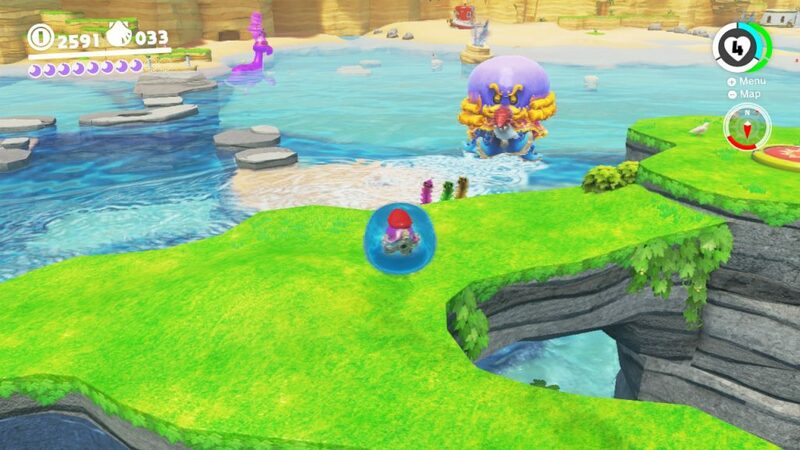 Mario does look a bit strange being short and stubby in a world of regular humans, but let that just be another one of the game's quirks. 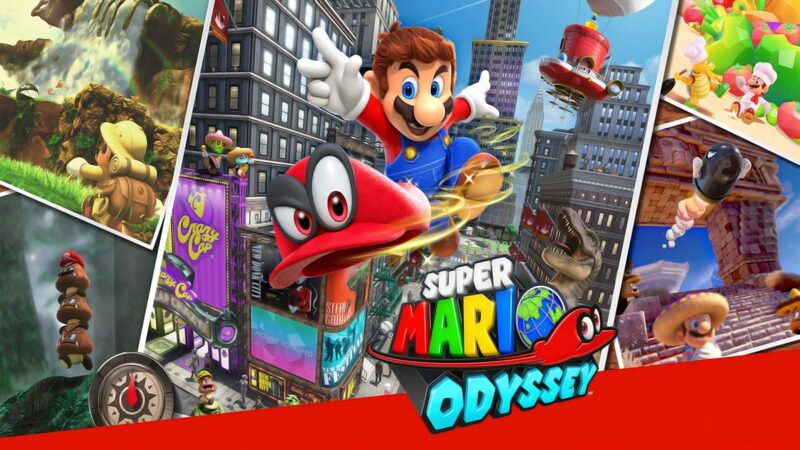 Like most Mario games in the past, the game is split up into various worlds, they are called kingdoms in Odyssey. Each one of these locations has a unique theme, for example, sunny beach, snowy peaks, ancient China. Each world is unique with different enemies (or at least Koopas with a themed hat) and friendly NPCs that stop things from feeling redundant since you are technically doing the same thing over and over when you visit a new kingdom. The main goal of each kingdom is to collect enough power moons (the same as stars in past games) to give your ship enough power to get to the next kingdom. The ultimate goal is to travel far enough to catch Bowser and rescue Peach. Most levels have 40+ moons which are more than the 20 or so you need to move to the next world. You can return to any kingdom at any point, so if you do not collect everything the first time around, you can go back after you have completed the story and collect all remaining moons that you missed. Gameplay is not something that Mario games ever do wrong. Running, jumping, swimming and attacking enemies are all very easy to perform. The platforming is so much fun because it is so easy to control Mario. This doesn't stop the game from throwing things at you that make it quite difficult to manoeuvre, but when you die, it is your fault, not Marios. The boss fights are also a lot of fun. You can take 3 hits (you can get a one-use powerup to bring that to 6), just like the boss, before you die. You need to figure out the patterns that the boss uses, and defeat him before he gets you. Every kingdom has a boss fight and while most are fairly simple and can be completed without dying at all, they still pose a challenge at times and were something that I looked forward to when arriving at a new kingdom. Super Mario Odyssey is a fairly long game. It took me about 10 hours to beat the main story, but I did spend time messing around and collecting extra moons that I didn't need in order to progress. I think the game should have put a higher moon limit in order to progress to the next kingdom. It was quite easy for you to miss things if you collect minimum required and proceed to follow the games instructions to move onto the next kingdom. It would also have been good if there was a little more to do than just collect moons. 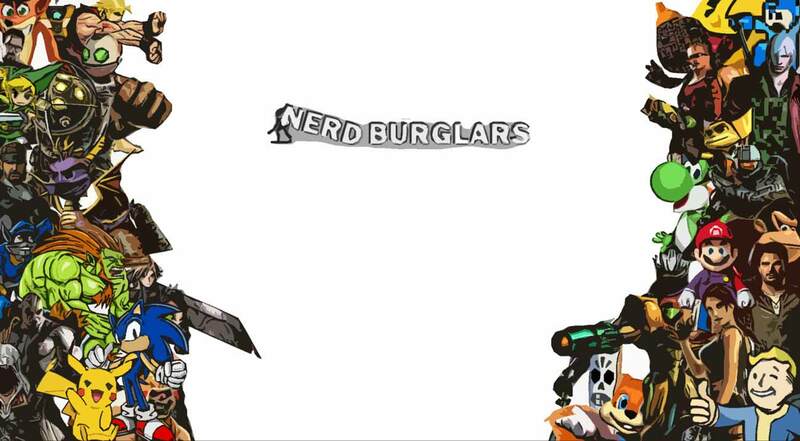 An objective other than find all of the collectables. This game sticks true to the tried and trusted Mario format, which is good, but perhaps it is time to add just a little more .At the end of the day, you can easily go back at any point and collect anything you miss, but how many people will bother to do this? The amount of moons in each world adds replayability and a reason to go back to the game after completing the story. Considering how enjoyable this game is to play, you will most definitely find yourself wanting to go back to other kingdoms, simply because you miss the scenery. Super Mario Odyssey is a must have for any Switch owner! All aspects of the game look really good. There is very little to complain about when it comes to this game. The visuals are perfect, the gameplay and controls are solid and the level design is diverse and enjoyable. I wish the game had of tried to take a page out of Zeldas book and shook things up a bit more, but overall it was still a highly enjoyable game that I would recommend to any Switch owner.